Baby, it’s cold outside. For those of us not lucky enough to be living in a tropical climate in the winter, November—with its diminishing humidity and plummeting temperatures—is a stark reminder that this time of year is not the most accommodating for cigars. It isn’t terribly accommodating for cigar smokers, either. Thanks to government-imposed smoking bans, thousands of decent cigar enthusiasts will be thrust into the cold and out of private restaurants and bars that otherwise would have welcomed them with open arms. One strategy for beating the winter-time blues is to limit your exposure to the elements by smoking shorter cigars. 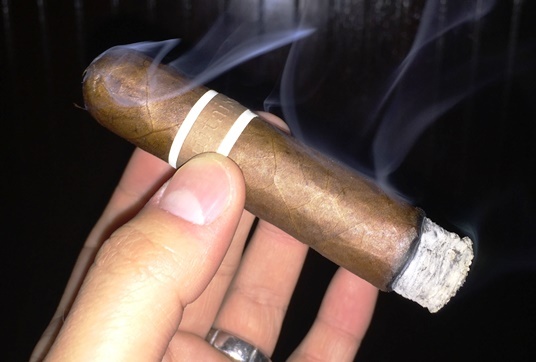 And if you’re looking to pack a mighty punch into a stout format, one excellent option is the Aquitaine Knuckle Dragger from RoMa Craft Tobac. By now, RoMa Craft—brought to you by Mike Rosales (the “Ro”) and Skip Martin (the “Ma)—needs no introduction. After all, the operation may be small with limited production, but it’s undoubtedly making some of the world’s best cigars. The lineup includes CroMagnon, Intemperance (EC XVIII and BA XXI), and Aquitaine. Aquitaine has the same filler blend (Estelí, Condega, and Pueblo Nuevo) and binder (Cameroon) as CroMagnon. But instead of featuring a Connecticut Broadleaf Maduro wrapper, Aquitaine has an Ecuadorian Habano Ligero wrapper. “This eighth and ninth priming Ligero leaf is thick, oily, and has amazing texture,” according to RoMa. The Knuckle Dragger (4 x 52) retails for $6.25 and sports a wrapper that’s rustic, toothy, and oily. It is on the firm side and the pre-light notes remind me of dried apricot and cereals. The nicely executed cap, even when only barely pierced, conceals a smooth cold draw. Right out of the gate, the flavor is bold with a rich, leathery texture on the palate. Introductory notes include leather, white pepper spice, espresso bean, and a bit of a cayenne heat in the back of the throat. A wonderful sweetness, likely a product of the Cameroon binder, adds a touch of cream to balance the blend. Towards the midway point, the body ramps up from medium- to full-bodied to full-blown full. There’s a hearty nicotine kick. Notes of roasted cashew join the profile. From there, the flavor remains largely unchanged to the nub, save for an increase in spice and heat down the home stretch. All the while, construction is exquisite. Expect a solid ash, even burn, and good smoke production. RoMa Craft has built its well-deserved reputation on quality, consistency, and great bang for the buck. The Aquitaine Knuckle Dragger lives up to these virtuous characteristics, and it does so in a winter-friendly format that delivers a ton of flavor in a relatively short time span. In my book, it’s worthy of a rating of four and a half stogies out of five. Patrick, as a Minneapolitan, I feel your pain. This sounds like a nice little smoke. I’ll make sure to check this one out. Great review as always. I’m interested in trying one of these. I’m smoking one of the regular CroMagnons right now, and I’m a big fan of them. Considering I normally prefer Habano-seed wrappers to CT Broadleaf, I suspect this will be right up my alley. Roma Craft makes some of the best cigars being produced these days and this is one of them.